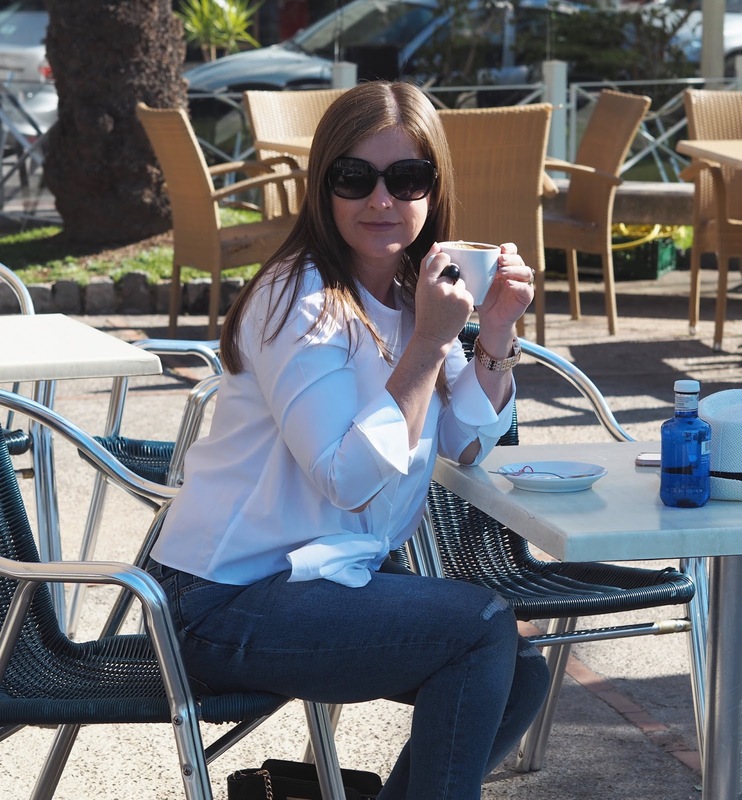 So I'm back with an outfit post but this time from sunny Palma on the island of Majorca. I mean if you're gonna do an OOTD post why not do it here?! You may have spotted from my insta stories that Mr C and I recently spent some time there, it was only a short break but we had the best time and as you can see the weather was fabulous. We did tonnes of walking and exploring so comfort was key. Although it was hot I knew I wanted something with long sleeves so I didn't have to keep slathering sun tan lotion all over my arms! This 100% cotton top was perfect for the job. It's loose fitting, so it's nice and airy and not clingy in the heat, comfortable to wear too. 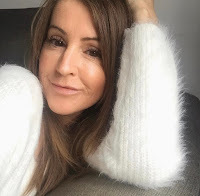 I seem to have a thing for white tops at the moment, they scream spring & summer don't you think? I styled this white top recently too. To be fair though, I think they're upping their game a little and I picked up a few bits including this white top. I love the front tie detail and I've turned the sleeves up to give it more of a 'shirt cuff style'. 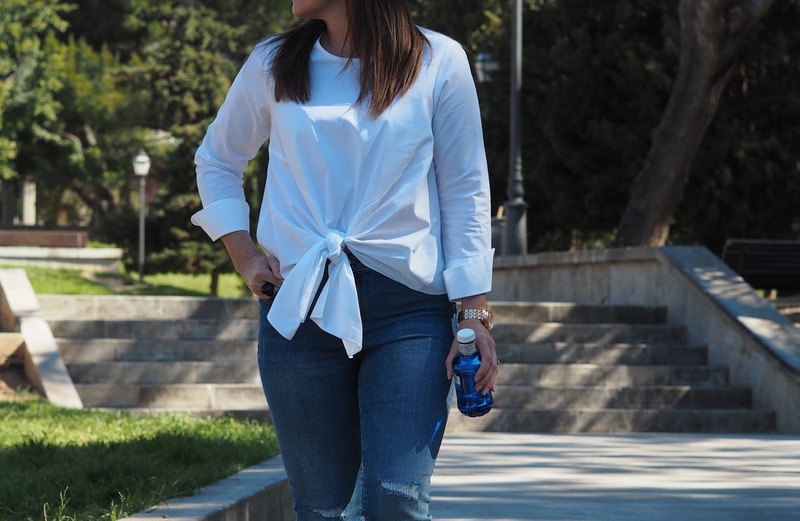 Pairing a white top with a medium or dark blue denim is a match made in heaven and these ones are a dream to wear. I struggle with getting jeans to fit, it's a right pain in the arse. I can get them to fit the legs, (certainly don't have any problem with them fitting the hip area!) but then I often find I have a huge gap around my back as the waist just doesn't fit! Anyone else? Anyway, I was sceptical when I took these to the changing room, assuming they'd be thrown in the unwanted pile, but no, they fit like a glove, well, not quite like a glove but nearly there, it's the usual hobbit problem, the legs are too long, but fear not I can just turn them up, and I gathered that as they're frayed at the bottom I can just chop a bit off and make them shorter if I want to, frayed jeans were made for short girls like us. Just lob a bit off, fray the ends a little and you're good to go!!! Now, the bag is a cheapie I picked up from Primark last autumn but I tell you what, I've certainly got some use out of it. It's the perfect size, quite rigid and I can fit a ridiculous amount in it. Shoes are some old faithful leopards from last year, as you can see they've had a battering but they're sooo good for walking. As for the rest of my sight seeing accessories, well, they included a hat, water and coffee. A hat is a must for me when I'm walking around for hours on end, my scalp burns badly, and this was from one of the lucky lucky men. He wanted 9 euros, got it for 5! I have four of these hats now, all exactly the same, but every time I go away I forget to take the one from home so end up adding another to my rapidly growing collection. I think I'll take them all next time and set up my own stall. Coffee, copious amounts needed to keep you bouncing along! What are your go-to items for spring right now? This outfit is perfect and totally something I'd wear too. I love old faithfuls. I have many items that have lasted a lot longer than I originally thought and am so grateful. :) Good bargain on the hat too! I'm all for denim, skinny or relaxed, trainers and a simple basic long sleeve tee. These are my go-to's at the moment. Love love love this! Gorgeous pics and I love the top! I love the tie at the front tops, but always steered clear as they always seem to be a bit short in the waist and no-one wants to see my belly and muffins lol. But this one seems the perfect length. White is always a fab colour for spring! Palma looks amazing! Wanna see more pics please!